It’s pretty much December and so we are well and truly into sweater season. While not an official season it is my personal favorite and if you want to add to your collection here are some of the best examples of bold designs that have recently appeared on TV. Striped sweaters are a weakness of mine, but I wanted to go beyond the standard Jess from New Girl options. 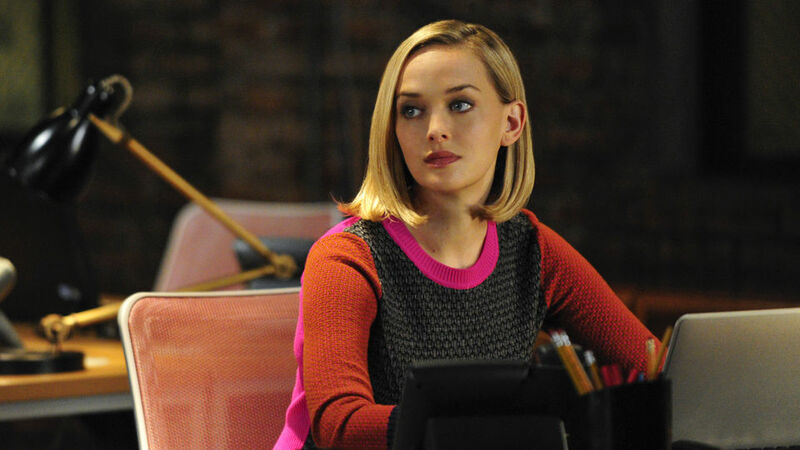 On the most recent episode of The Good Wife, Robyn wore a Fairlee Colorblock wool Diane von Furstenberg sweater (this item is currently on sale) in what is referred to as ‘Fetish Pink.’ The pink and orange clash, but it’s a combination that works thanks to the charcoal grey block in the middle. Robyn’s costuming is wildly different from Kalinda’s leather look and from the sharp tailoring of everyone else at Florrick/Agos. Bold colors are part of the Robyn styling and this helps disarm those she is investigating. It also means that people she works with might not take her too seriously which is why she has been working extra hard to save her job. The costuming of April Ludgate influenced my decision to start TV Ate My Wardrobe as each episode pretty much had me stating that I wanted to own something she was wearing. April’s clothes tend to be a lot more colorful than you might expect from a character who professes that she hates most things. One thing April doesn’t hate is animals so the owl is rather apt and this jacquard sweater by Isabel Marant is high on my wish list (sadly it is currently sold out). 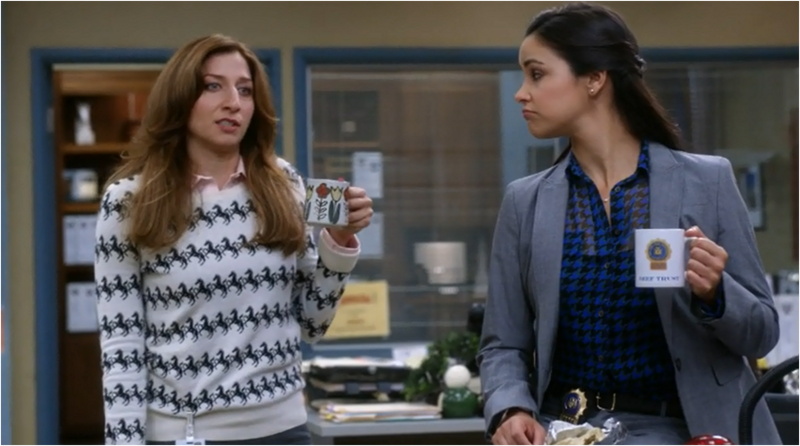 Moving on to something more affordable and Gina’s French Connection horse sweater from episode 3 of Brooklyn Nine-Nine is on sale at the moment. Gina’s wardrobe choices are a bit more free and loose over the other female characters on this show because she’s the only non-cop and this monochromatic equine number is delightful. 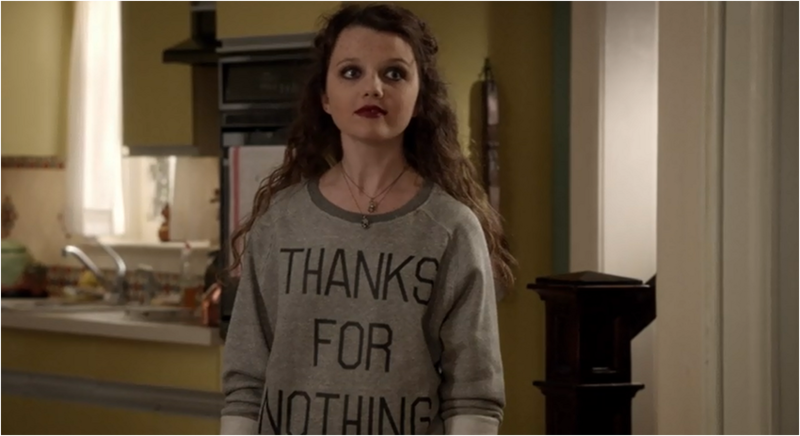 Ah the slogan sweater and while this Forever 21 “Thanks for Nothing” emblem isn’t really something I can see myself wearing now, it’s got the right amount of teen angst for a character like Dorrit on The Carrie Diaries. This show might be set in the ’80s but a lot of the clothes are contemporary and come from stores that teenagers both shop at and can afford.